7 nights, 5 ½ days ridning, approx 7-8 hours per day during trail. Min. 6 persons and max. 8-10. 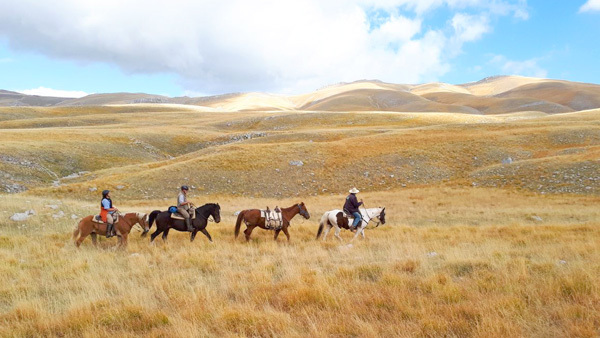 At about 10 a.m. we get in the saddle and follow the Tratturo Celano-Foggia. 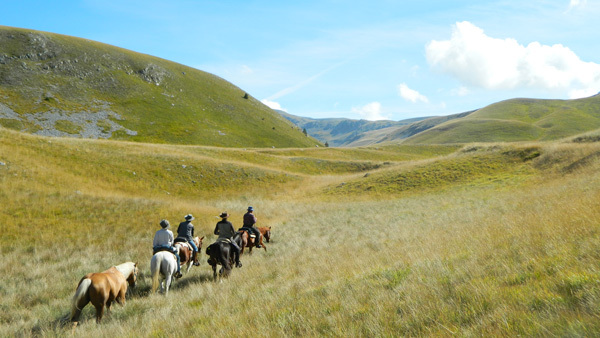 A Tratturo is a 2.000 years old track that is still used to move cattle from the far south where grass is scarce in summer. Picnic is in Montedimezzo which used to belong to the royal family of the Bourbons. The hunting lodge nowadays contains a museum. The forest is protected by UNESCO. Worldwide this organisation protects 256 forests. Four of them are located in Italy with two in Molise. We continue along the Tratturo as far as the river Sangro. Here the Tratturo begins to be very wild and quite overgrown leaving us narrow paths to follow. The horses stay overnight at a riding centre, which also features a restaurant. We will enjoy dinner there before heading for a nearby hotel for the night. Today’s destination is the small town of Pescocostanzo. The trail takes us through increasingly high mountains. Arriving at the top of the pass we can enjoy two very different panoramas. Looking back we have the hilly landscape of Molise. 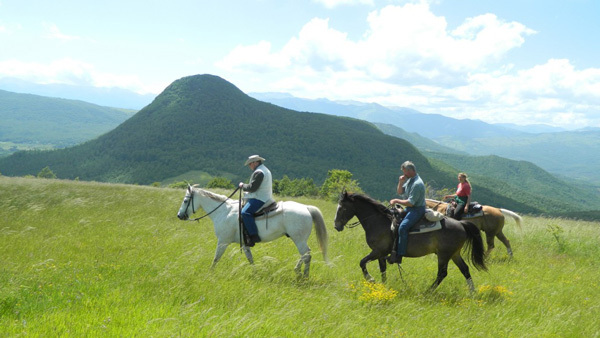 In front of us the Majella National Park welcomes us with its high mountains and vast valleys. At the end of the afternoon we canter through one of these valleys. Having spent about 7 hours on horseback we are bound to be longing for a drink. Pescocostanzo has a nice main square with several bars and restaurants. Taking a walk in this picturesque medieval town is a pleasure for everyone and a must for those interested in architecture. We are staying at a cute little hotel in the historic town centre and enjoy dinner at a restaurant close by. 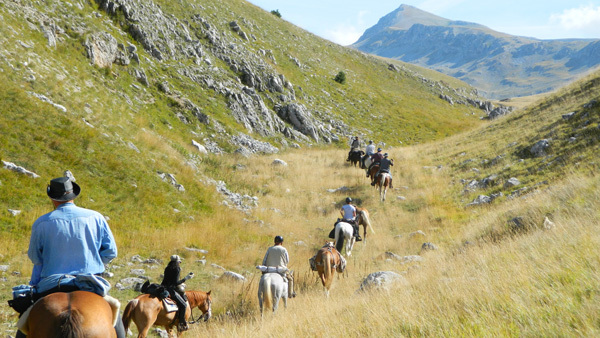 Today we leave the Majella National Park and enter the Abruzzo National Park. The first part of the trail leads us to the Piano delle cinque Miglia (the Valley of the five Miles). Here we enjoy a long canter! At the end of the valley tall mountains loom up at either side. A gravel road takes us to the Montagna Spaccata (split mountain) where benches under old oak trees tempt us to stop. Then we turn left and the scenery becomes different, a bit like a lunar landscape with a little lake. At the end of the day a skiing track takes us down the mountain. The horses will be left at a stable. The riders dine and spend the night at a hotel in Roccaraso.